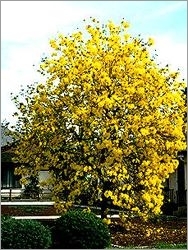 Tabebuia chrysotricha or Tecoma chrysotricha, also named the Golden Trumpet Tree, is a small to medium tree, evergreen, or briefly deciduous in the Spring, 15 to 25 feet tall. It originates from Brazil. Showy, deep yellow trumpet shaped flowers, 3 to 4 inches long, up to 2 inches wide, in dense 2.5 to 8 inches long terminal clusters, containing up to 30 flowers, are borne on graceful, wide-spreading branches in early Spring, March-May during brief deciduous period. There is a red stripe on the throat of the flowers. Sometimes it blooms at other times, when leaves are present. The lack of leaves during the bloom makes it extremely showy.